On our last night I think that we have now hit all the restaurants. They have Gordon’s on the Pier, Baccarat, Kimonos, Casanova, Stew Fish and the Crystal Room for supper. Gordon’s on the Pier is located on the end of the pier and is available only to guests that have Butler service. If you don’t have Butler service, you would have to pay $170.00. Ok, so this is the one we missed. With so many other great restaurants I don’t think we missed a thing. Three of the restaurants must have reservations. These are Baccarat, Kimonos and Stew Fish. My suggestion is that you make your reservations for these restaurants when you arrive as they fill quickly and you don’t want to miss any of them. Our first night we went to Cricketer’s Pub. It is a British pub which serves shepherd’s pie, bangers and mash and fish and chips. The Pub is a great place to eat when you want to just relax and wear your shorts. This is the place to come for those late night snacks as they are open until 2:00am and then start serving continental breakfast from 3:00am to 7:00am. So for those of you that have an early flight, you’re covered. We ate lunch at the Pizzeria where the pizzas are made to order in the outdoor wood burning oven. The pizza here is very good. The other lunch spot is the Royal Cafe where you can have fresh salads, burgers, curly fries, sandwiches and some great appetizers. Kimonos is a Japanese Teppanyaki restaurant that was such fun. It was a great show and great food. The Crystal Room has white glove service with great food. The room got its name from the huge crystal chandelier that dominates the room. Our favorite restaurant was the 5 star Baccarat. You sit at individual tables that face out to the pool and the way they are designed it feels that you are sitting in your own space. Very romantic with great service. I can say that we didn’t have a bad meal at any of the restaurants and the service was something we don’t see very often at home. So make sure to hit all the restaurants. Well it’s time to go home and get back to work. 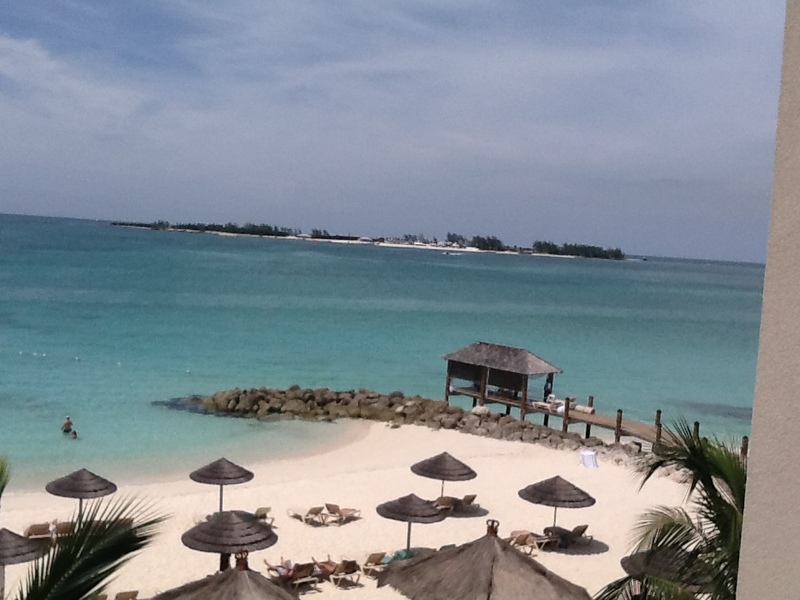 We have really enjoyed our stay here at Sandals and I would say that it is one of my favourites. The weather has been hot and sunny all week and we are going home well rested. Again we are only 15 minutes from the airport and we are there before you know it. The line ups are not long so we head through security. Right now, Nassau is in the middle of airport construction so once we pass through security to find nothing behind security. There are no restaurants or shops. We are taken to a room where we wait for a bus to take us to the new terminal where our gate is. When we arrive at the new building, there is not much here either. There is a small bar, small shop with pop, chips etc, very small duty free mostly liquor and a small kiosk with hot dogs burgers etc. There is no shopping here so make sure you have shopped for everyone before you come to the airport. Our flight is on time and we leave the Bahamas behind but hope to come back soon. Colleen’s Sandals Bahamas – Part two! One of the things that Sandals Bahamian has that no other resort has is their own island. The island is a half mile off shore and there is a shuttle boat that takes you out there. The first shuttle leaves at 10:00am and then every hour until the last boat leaves the island at 4:50pm. We miss the first shuttle so we take the 11:00am shuttle. The shuttle is full before we get on so we wait about 10 minutes for them to come back to pick us up. We reach the island to be greeted with a welcome drink and we start to look for a chair. They have chairs all over the island so that is not a problem. We are actually wondering where all the people went as the island looks empty. Right by the dock is a pool and restaurant. We decide to head out past the pool to find some chairs. We follow the path to the end of the island where there is a Zen garden with fountains and the Red Lane Spa. Our chairs face out to the ocean and it seems like we are alone on our own island. The swimming here is not great as there are a lot of rocks but you can wade out. Before long it’s time to head back. We really enjoyed our time here but take bug spray as the island has a lot of mosquitoes and sand fleas. I have stayed at a lot of resorts and the entertainment is usually not that good but the same cannot be said of Sandals Bahamas. The entertainment here is good and varied. It could be that they have a lot of talented people on the island or that someone here at Sandals takes the entertainment seriously. They have some of the best entertainment we have seen in a long time. Early in the evening they had a sax player by the pool that was so good. They had more than just your late night entertainment. They definitely had some great singers and bands while we were here but by far the best entertainment was a local junior high school marching band that we saw tonight. They played all over the resort, through every restaurant and then played at the main pool. They played, marched and danced for over 20 minutes. It was so good. Who thinks of these things?! Obviously someone from Sandals. Thanks Sandals for keeping us up past our usual 9:00pm and really entertained. I am just sorry that I didn’t have my iPad with me so you could have enjoyed the band along with us.